Genetic engineering, sometimes called genetic modification, is the process of altering the in an organism’s . This may mean changing one (A-T or C-G), deleting a whole region of DNA, or introducing an additional copy of a . It may also mean extracting DNA from another organism’s genome and combining it with the DNA of that individual. Genetic engineering is used by scientists to enhance or modify the characteristics of an individual organism. Genetic engineering can be applied to any organism, from ato a sheep. For example, genetic engineering can be used to produce plants that have a higher nutritional value or can tolerate exposure to herbicides. To help explain the process of genetic engineering we have taken the example of insulin, a that helps regulate the sugar levels in our blood. Normally is roduced in the , but in people with type 1 there is a problem with insulin production. People with diabetes therefore have to inject insulin to control their blood sugar levels. Genetic engineering has been used to produce a type of insulin, very similar to our own, from yeast and like . This genetically modified insulin, ‘Humulin’ was licensed for human use in 1982. A small piece of circular DNA called a is extracted from the bacteria or yeast cell. A small section is then cut out of the circular plasmid by restriction enzymes, ‘molecular scissors’. The gene for human insulin is inserted into the gap in the plasmid. This plasmid is now genetically modified. The genetically modified plasmid is introduced into a new bacteria or yeast cell. This cell then divides rapidly and starts making insulin. To create large amounts of the cells, the genetically modified bacteria or yeast are grown in large fermentation vessels that contain all the nutrients they need. The more the cells divide, the more insulin is produced. When fermentation is complete, the mixture is filtered to release the insulin. The insulin is then purified and packaged into bottles and insulin pens for distribution to patients with diabetes. What else is genetic engineering used for? The first genetically modified organism to be created was a bacterium, in 1973. In 1974, the same techniques were applied to mice. In 1994 the first genetically modified foods were made available. 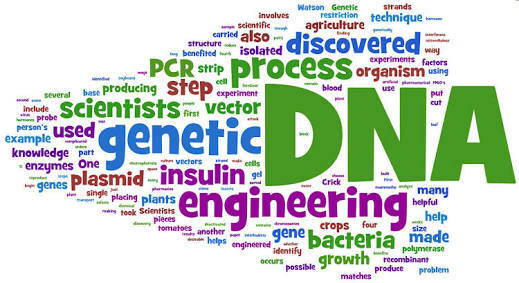 Genetic engineering has a number of useful applications, including scientific research, agriculture and technology. In plants, genetic engineering has been applied to improve the resilience, nutritional value and growth rate of crops such as potatoes, tomatoes and rice. In animals it has been used to develop sheep that produce a therapeutic protein in their milk that can be used to treat cystic fibrosis, or worms that glow in the dark to allow scientists to learn more about diseases such as . The nematode worm, C. elegans, only has around 300 cells in its entire nervous system, making it a very simple model for studying Alzheimer’s disease. Also, due to the fact the worm is nearly transparent, when their nerve cells are labelled with green fluorescent protein (GFP), it is possible to watch the location and activity of various structures and proteins under the microscope. The genetic material of C. eleganscan easily be genetically modified to make the worm produce specific proteins the researchers want to study. In humans, the APP gene codes for a protein associated with the amyloid plaques that are characteristic of people with Alzheimer’s disease. So, to study Alzheimer’s, the researchers genetically engineered the nerve cells of the worm to contain the APP gene, effectively giving it Alzheimer’s. By tagging the APP protein produced in the worm with green fluorescent protein it was possible to see that all the cells that made contact with APP died as the worm got older. The researchers were then able to monitor the progression of Alzheimer’s disease in the worm and go on to apply their findings to understanding the role of APP in humans with Alzheimer’s disease.